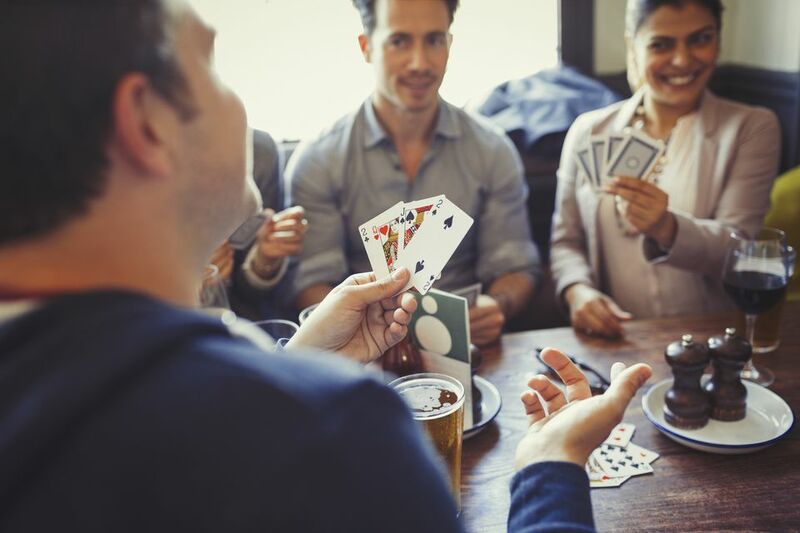 A game for partners who can "go alone"
Euchre is a trick-taking card game that can be played with four players in two partnerships. The goal is to be the first partnership to score at least 10 points. This is only one form of the game; It can also be played as Two-Handed Euchre, Three-Handed Euchre, and Railroad Euchre. In North America, a 24-card deck is most common (using nine, 10, jack, queen, king, and ace in all four suits). Some players prefer a 32-card deck (adding the seven and eight of each suit). British Euchre uses 25 cards (the 24 listed above, plus a joker). There are other variations as well. These rules are for 24-card Euchre and use North American customs. The general rule is that aces are the most valuable cards and nines are the least valuable. There are two exceptions. The jack of the trump suit is the "right bower," and it's the most valuable card. The other jack of the same color is the "left bower," and it's the second most valuable card. Partners should sit across from each other; a dealer is randomly chosen. Each player is dealt five cards. The remaining four cards are placed face down in the middle of the table. The top card is turned face up; this card initially sets the trump suit. Some traditions have the dealer pass out cards as follows: three to the opponent on his left, two to his partner, three to the opponent on his right, two to himself, two to the opponent on his left, three to his partner, two to the opponent on his right, then three to himself. The player to the left of the dealer may pass or say "I order it up." If he does, no other player may bid. If the first player passes, the player across from the dealer (the dealer's partner) may pass or say "I assist." If he does, no other player may bid. If the first two players pass, the player to the left of the dealer's partner may pass or say "I order it up." If he does, no other player may bid. If the first three players pass, the dealer may pass or say "I accept." If he accepts, he takes the face-up card, replacing it with a card from his own hand (face down). The suit of the face-up card becomes trump. If all four players pass, the second round of bidding will take place (see below). If either of the dealer's opponents says, "I order it up," or the dealer's partner says, "I assist," the dealer has the option of picking up the face-up card and discarding one from his hand, face down. Whether or not the dealer picks it up, the suit of the face-up card becomes trump. If all four players pass in the first round of bidding, the face-up card is turned face down and a second bidding round occurs. In the second bidding round, the first player who names a suit has chosen trump. If no player bids, all the cards are shuffled together and the next player deals a new hand. The partnership that chooses the trump suit in either bidding round is known as the "makers." The other partnership is known as the "defenders." If you think you have an outstanding hand, you might want to "go alone." This means that your partner sits out, placing his cards on the table face down, and you play this hand without a partner. Anyone may announce that they're going alone after trump is selected but before the first card is led. It's possible that two players, one from each partnership, will both choose to go alone on the same hand. The player to the left of the dealer leads first by playing any card from his hand. Exceptions: If someone has chosen to go alone, the player to that person's left leads first. If two players have decided to go alone, the player on the team that did not choose trump (the defender) leads first. Players must play the suit of the card led if possible. If not, they may play any card. The highest card played in the lead suit wins the trick, unless one or more trumps were played, in which case the highest trump card wins the trick. The player who wins the trick leads to the next trick. If all four players take part in a hand, the makers score one point for taking three tricks. They score a bonus point (two total) for taking all five tricks. If the makers fail to take three tricks, they are "euchred" and the defenders score two points. If a maker goes alone and wins all five tricks, his partnership scores four points. If he wins three or four tricks, his partnership scores only one point. If a defender goes alone and wins three or four tricks, his partnership scores two points. If he wins all five tricks, his partnership scores four points. The first team to score 10 points wins.